Teksti-tv 666 prove you can't have too many guitars in a band. It’s official: you can’t have too many guitars in a band, as proven by Finnish punk-rockers Teksti-tv 666. With this crazy and wild group of seven, you can see five – sometimes even six – electric guitars on stage at a time. They sing in Finnish but it’s possible to understand their energy and thrive because it exists beyond language. Seeing them live, you will soon realise that, yes, this is pure magic! Teksti-tv 666 have established a strong reputation as a live act; anything is possible when these seven guys are having fun together and spreading their carefree joy. The band started by singing in English but soon switched to their native language. Their debut EP, 1, was released in 2014, followed by a second EP called 2 a year later, while 3 was released in 2016. The band has played countless live performances and have even spread their wings beyond Finland. 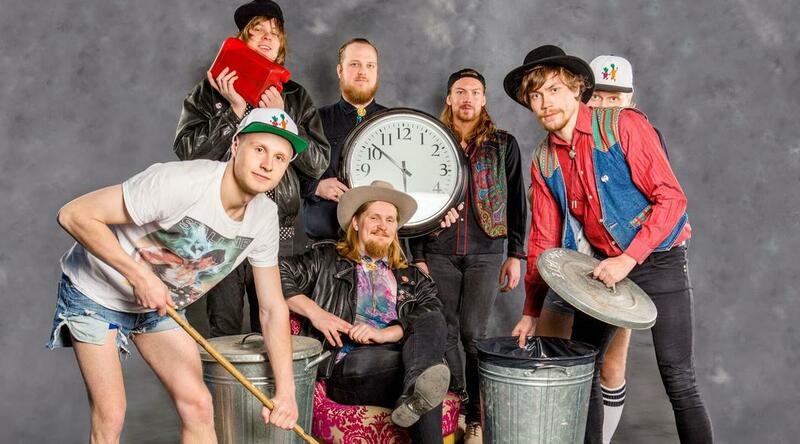 Their debut single, ‘Piritorilta taivaaseen’ grabbed the attention of Radio Helsinki and In 2014 Teksti-tv 666 were selected as the Number One Future Hope in Finnish music scene. Their unique style mixes the 1970s, free spirits, parties, monstrous rock and a devil-may-care attitude.